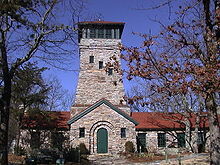 Cheaha Mountain, often called Mount Cheaha, is the highest natural point in the U.S. state of Alabama. 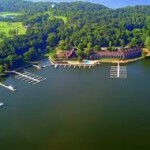 It is located a few miles northwest of the town of Delta in scenic Talladega State Park, which offers a lodge, a restaurant, and other amenities. 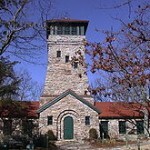 The highest point is marked with a USGS benchmark in front of Bunker Tower, a stone Civilian Conservation Corps building with an observation deck on top. The CCC also constructed a road to Cheaha, but the road has been closed for years. The old road is known as CC Road and contains interesting ruins. Near the peak is Bald Rock, which was recently improved with a wheelchair-accessible wooden walkway that provides an impressive overlook of the surrounding region. The entire area gives an impression of being at a much higher elevation than it actually is, in part because of the relatively low elevation of the adjacent area to the west.